A year ago, I made a back to school teacher gift that I considered practically perfect (mainly because it is something this teacher mom wants to have). After making the Swim Coach Survival Kit, I decided to blend last year’s teacher gift with this summer’s swim coach gift for an updated Teacher Emergency Kit. I originally saw the idea on a site called Tidy Mom. If you read last week’s post, the directions below are about the same, but I have new pictures and some additional notes. You do need a sewing machine for the potholder bag. If you do not have a sewing machine, use the plastic bead box from last year’s post. Or, use the bead box if you just like that container better. Set your potholder on a flat surface with the loop on the right side. I have the potholder “hand pocket” facing inside, but I also made the bags with the pocket on the outside too. It is up to you how you want your potholder to face. Place one snack bag on the right side with the baggie opening facing the right edge. 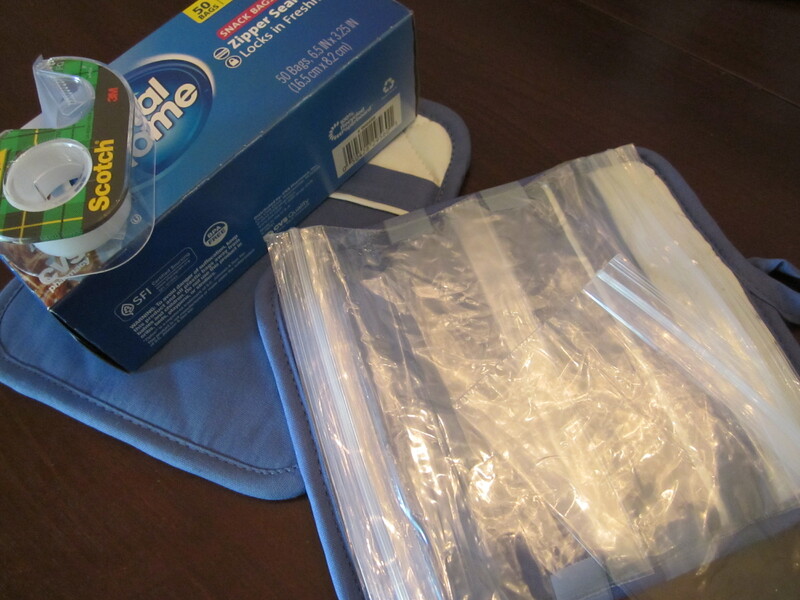 Place a piece of tape on the top and bottom to keep the baggie from moving. Place another snack bag on top with the baggie opening facing the left edge. The center should overlap with the first baggie. Place a piece of tape at the top and bottom. Continue alternating baggies right and left. I liked 5 snack bags (=5 pockets). The Tidy Mom post used 10, but the bags fill up fast if you include bulky items and then the clutch won’t close. Sew a zig zag stitch down the middle of the potholder, which should also be down the center of the Ziploc bags. Cut any loose threads. 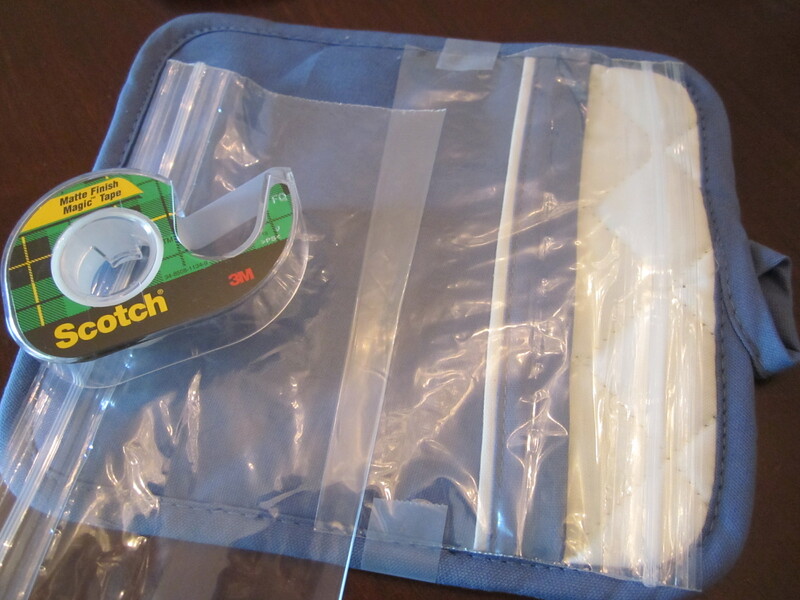 Carefully remove the tape from the edges without pulling or stretching the plastic bags. Fold the clutch in half and pull the loop around to the front and eyeball where the button will need to be placed. If you do not have a loop on the potholder, follow the Tidy Mom site’s directions for adding a loop. Attach the button with coordinating thread. Gather the items you want in your emergency kit. I dug into my assortment of plastic bead bags and filled mini baggies with Advil, Tums, and mints. The clutches fill pretty quickly and flatter items work better. 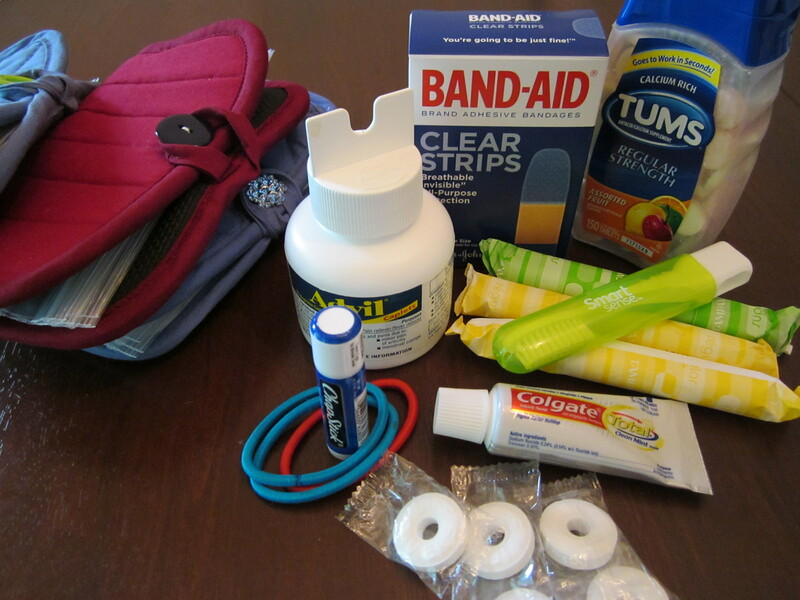 You won’t be able to fill the kit with as many things if you use travel sized aspirin tubes and whole rolls of Tums. 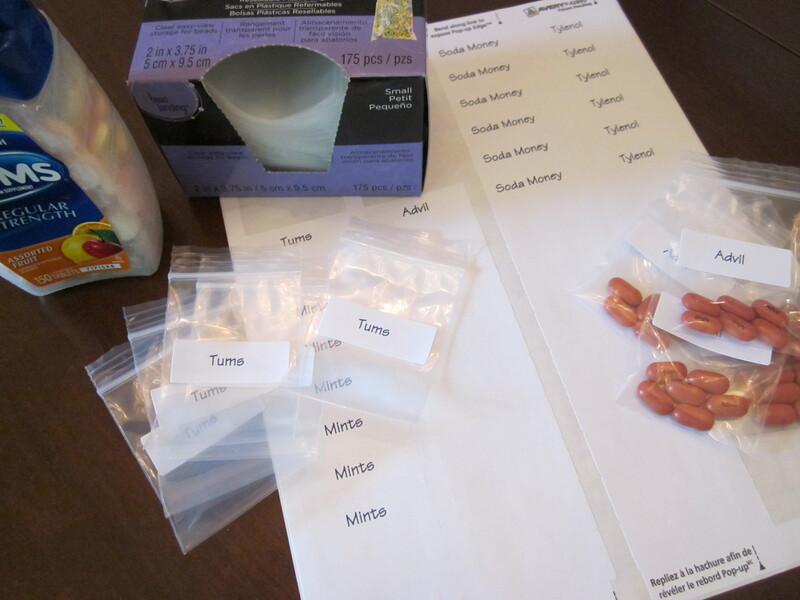 I printed Avery labels and attached the Teacher Emergency Kit Baggie Labels to the little bags. The label size is 2/3″ x 1 3/4″ and is Avery #42895. I created a Teacher Emergency Kit Gift Tag page and printed it on white cardstock, cut it into squares with my paper cutter, hole punched the corner, and tied with curly ribbon to the loop. Don’t cheap out on the Ziploc bags. I bought CVS generic brand on sale, and they are a little flimsy. I wish I had used Ziploc or Glad snack bags. Click the picture to see the directions for last year’s Teacher Emergency Kit in the bead box. 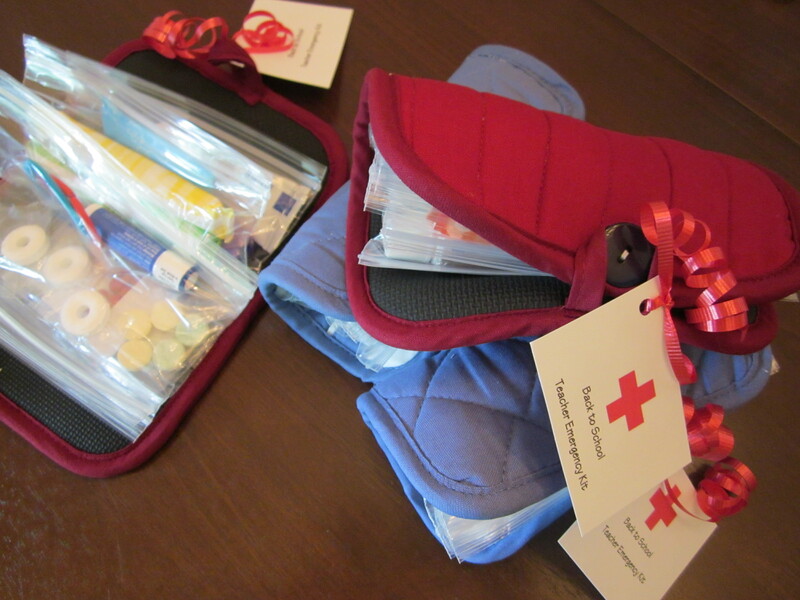 I am giving away Back to School Emergency Kits to TWO lucky winners. 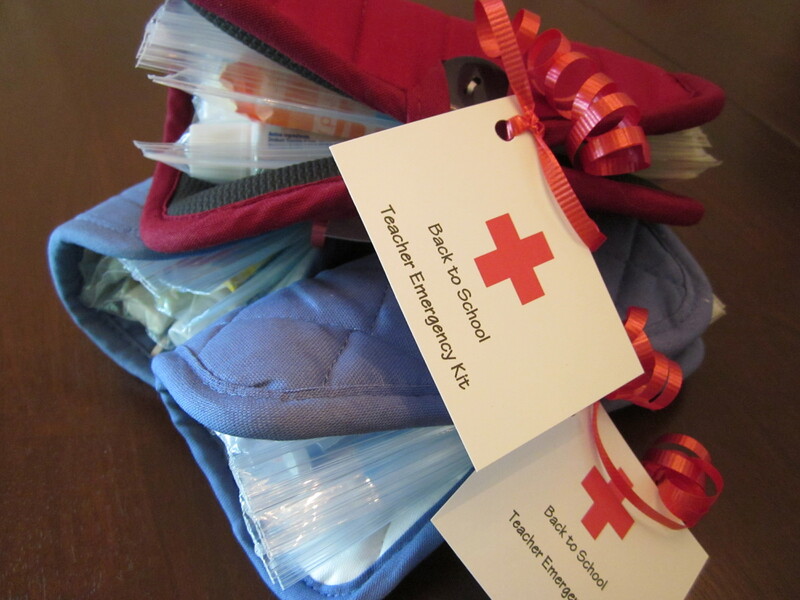 Give the kit to your child’s teacher on the first day of school or keep it for yourself. But wait, there’s more. 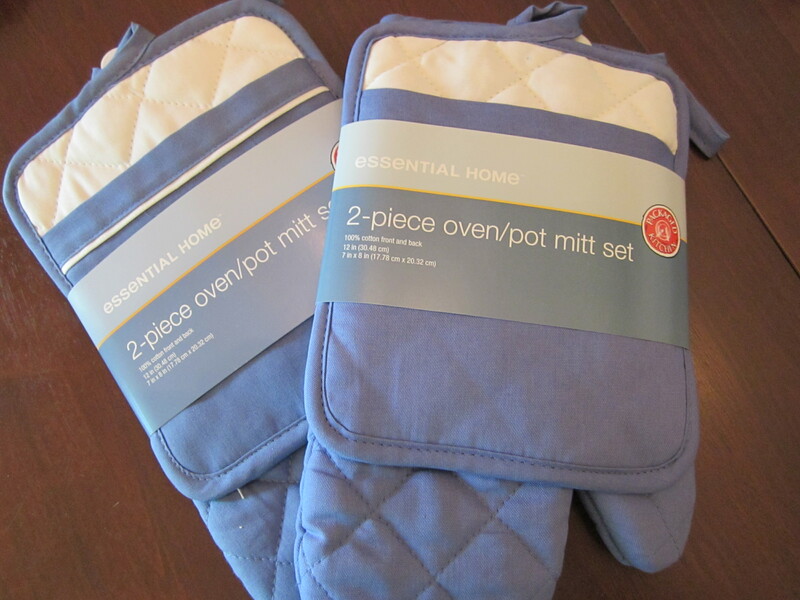 Not only will each winner receive one filled Back to School Kit, he/she will also receive not ONE but TWO oven mitts because I had to buy oven mitt SETS to get the potholder I wanted, and I now own about 10 mitts! Giveaway ends Sunday, Aug. 4, 2013. Click on this Entry-Form link to enter the giveaway! The entry form links to TheRoomMom on Bloglovin, Facebook, Twitter, and Pinterest where you complete the regular “like” or “follow” procedures on the social media sites directly then submit the entry form after you complete the like or follow. Just hitting submit does not create a follow or like. You can also leave a comment below and enter the name you used to comment in the entry form. All likes, follows, and comments are “verified” at the end of the contest, and the two winners will be randomly selected. It is more confusing than I would like, but it is my first experience with a giveaway site. Maybe you will win one. Then you won’t have to make it yourself! I love all your ideas. I bet the teachers loved them! You are so nice to always comment. I love all of your food ideas. Looks great! Always good to get tips on how to make teachers feel special, too. Enjoy the new school year! Love these bundles. Do you think the zip-lock baggies hold up for a while? Wondering what else could be used that would maybe even be washable. Pencil holders or mini-binder folders?? I might have to go trolling the aisles at Staples or Michaels! I think the baggies can get sort of stretched out. 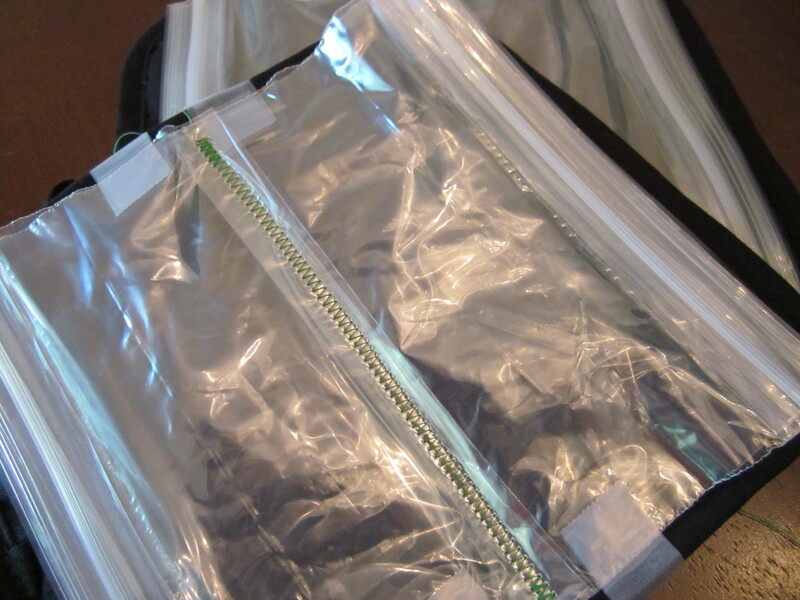 I will definitely use a heavier duty Ziploc bag next time, but I already had the supplies and could not stand the thought of another trip in the car with the kids in the heat. I went to 5 different places to find potholders that were the right size and shape! To save you some trouble… Bed, Bath, and Beyond, Walmart, Target, and Dollar Store did not have the right size or shape. Williams Sonoma has really good potholders that are too big (bought those and had to return). I like this idea. Thanks for sharing. I think I will have to try to make a couple. I might make them a bit bigger though and use larger ziploc bags. I thought about that too but couldn’t find the right “shell” for the outside. Let me know if you come up with something! I was thinking maybe a quilted placemat or a piece of quilted fabric might work. I thought about the placemat, but I would have to reduce the size a little and that involved finishing the edges. My sewing skills are limited! I love this idea! I tend to be the “go to teacher” for all sorts of random things, I could see me making a few to give to my colleagues. It would be a great little sirsee (just because gift) for teacher co-workers! So, I love this… I think I’m going to whip out the sewing machine and make some material pockets, and make them for the people on my hall. We really should build community, and so I’m going to try to come up with a monthly gift on the first of the month… One day, I went around handing out candy bars, and it really went far. Just took an hour and gave one to everyone in the school. An idea I stole from James Altucher, but fantastic… That’s going to be in my game plan–not candy, but motivational, affordable things. So, I want to do something like this once a month in general… like a hall-wide morale booster/community builder. We’re high school, so maybe a flask—no, just kidding… but something people will use or enjoy like those kits. I was thinking of a couple keurig pods w a note that says “stop on by” because the machines in my room. I like the other ideas. Yes, I would love that and definitely be camped out in your classroom. A teacher across the hall would bring a tray of muffins or some other breakfast bit about once a grading period. We loved it! Sadly, she is moving to a different school this year.